Star winger Justin Carney has been suspended by Castleford Tigers. The Tigers have issued a statement saying that their top try scorer is the subject of a club internal investigation. The club said: “Castleford Tigers RLFC can confirm that Justin Carney has been suspended from the club with immediate effect, whilst an internal investigation is undertaken. 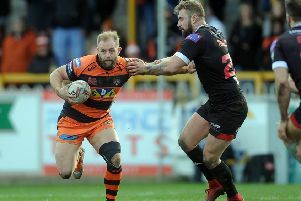 Australian Carney has become one of the most exciting players in the Super League since joining Castleford from Sydney Roosters ahead of the 2013 season. A try scorer in last Saturday’s defeat at Catalans Dragons, he has scored 18 tries in as many appearances this year. He joined the club on an initial two-year contract and signed a new five-year deal last season.